Most current uses of Open PSI (Public Sector Information) related to real estate fall in two categories. The first serves people looking to buy or rent a house. The London, where can I live? looks at this problem from a commuter point of view: the users declare where they work in London and how much they can afford to pay for a home. 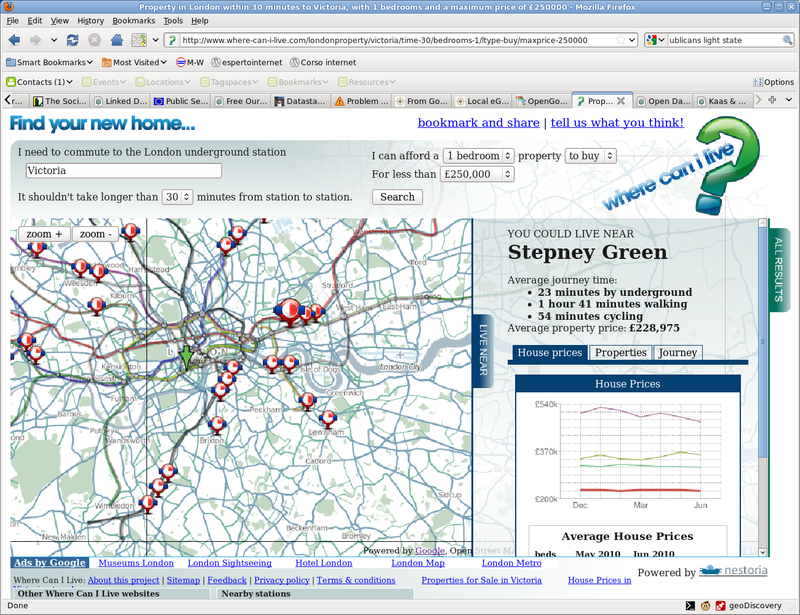 The software, combining travel time between stations house-for-sale listings and average house prices, shows where they can live and how long it will take to go to work from each available place. The other category of house-related Open PSI applications assists citizens who already are homeowners. A great example of this type is Husets Web in Denmark. Combining all sorts of PSI from local energy costs to weather statistics, maps and the technical characteristics of the materials used to build each house with extra information provided by the homeowner, Husets Web provides practical tips to reduce pollution and save on energy costs through an energy optimization calculator. What’s particularly interesting is that the website also makes it very easy and quick to get a quote from local craftsmen (from plumbers to electricians) for remodeling a house in order to achieve those goals. In other words, Husets Web successfully uses Open PSI to stimulate creation and survival of local jobs that in and by themselves have nothing to do with the Internet, programming, or any other high-tech, “knowledge-economy” activity. Fix My Street in the UK allows citizens to report problems like graffiti, fly tipping, garbage, broken paving slabs or street lighting in a Web page and inform by email the council that would be in charge of fixing that problem. Of course, in order to work properly, Fix My Street or any other similar services like the Open311 websites in the USA, need to have unrestricted accesses to official digital maps as well as addresses and/or postcode databases. When the reports are actually and consistently used by the Public Administrations as input for their work, there are obvious savings coming both from more efficient usage of their personnel and from less delays and accidents for citizens or increased home values. Similar online databases have been proposed in the UK for derelict buildings, in order to easily find their owners and pressure them to fix those buildings or just tear them down, to recover the space and therefore reduce pressures for building on green field sites.